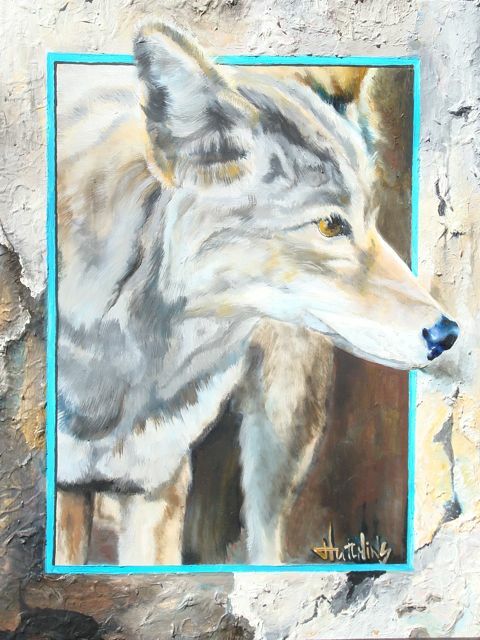 This coyote was one I came upon during a “photo safari” I did one of the days while an Artist in Residence at the Grand Canyon National Park. I’m from Prescott, so I see coyotes all the time, but NEVER have I seen one this big and healthy! He came within 30 feet of me and just stood there posing as if he knew exactaly what I wanted, then trotted back off into the forest. I wanted to paint him a little different than most of my animals so I experimented with “framing” him in rock. It was a cool experiment. First I marked the gesso board…it needed to be a firm surface…with my “mat”. Then I took thick gesso and chunked it on the mat part of the painting. When that was dry, I took acrylic paints, tourquoise, black and copper and a few other colors and made odd shaped stripes or veins. Once that was done I started the actual oil painting. My objective was to make the mat look and feel like rock, as if he were stepping out of a cave. I think it worked! This made me want to play a lot more painting “rocks”.